Home page Helpful Tips How to buy a good hookah on vacation. Hookah decorative "I was in Egypt, smoking a hookah." Designed to decorate the interior of the room. Quite a little hookah is suitable, so that a lot does not occupy a place - 30 centimeters is enough. The main thing here is the "external decoration" of the hookah. The quality of smoking you with this option should not worry. There are even special decorative hookahs with sealed tubes. "And on the closet it's beautiful, and you can theoretically smoke." Choose a hookah from this option, but when you buy, you still need to pay attention not only to the beauty of the appearance, but also how it will work. Even a thirty-centimeter hookah can be made to work more or less tolerably. This option is also suitable for those who prefer to keep their hookah with them. "I have the coolest hookah. "... no, I have not yet tried to smoke"
And more, more mouthpieces from different sides. Smoking does not work, but guests will be shocked by his appearance, it will not smoke. "I want to buy a normal hookah." This is a suitable class of hookah 50 cm. And the quality of smoking is good, and the space will not take long. If necessary, you can take a picnic. prevents accidental burns on coals, especially in close contact with a large company. When choosing, pay attention to the fact that the cap, dressed in a hookah, should not touch the coal. The minimum distance of the hood to the coal is about 1 cm. The hood should be equipped with any handle, so that if necessary, it can be removed in a hot condition. Ceramic cups, covered with glaze, are better than not covered by it. Glazed cups are easier to clean, do not absorb odors. Cups with one hole in the middle are almost always lower, they require a smaller hood, but when smoking you have to put pebbles so that tobacco does not get into the hookah. Cups with several holes are almost always higher, do not always fit under the hood. But not everyone has a hood, so even such cups have the right to life. In addition, such cups without a cap look good. If you use ordinary coal (preferably oak), rather than a special hookah, it will be more convenient to take a large cup from which coal will not fall. 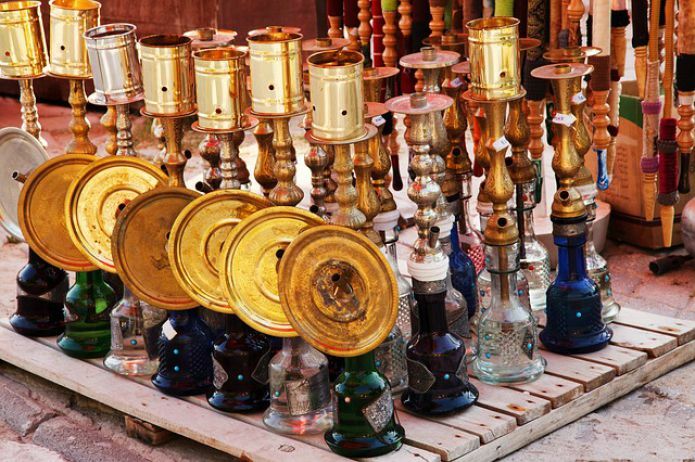 Since cups, like the whole hookah, are made by hand, they can be uneven, but it's not scary. The main thing is that the hole that they put on the hookah, round, the rest is not so important. on it it is possible to put forceps. It is desirable that the saucer does not hang strongly on the hookah, and even better, so tightly put it on top. If the saucer is motionless, it's worse. Better than a dish with high sides, it is less likely that it will disperse a fallen or specially packaged coal. In some hookahs, the cap is placed only on the saucer, because the elongation at the top of the hookah is less than the diameter of the hood. If you take a hookah class 50 cm, keep in mind that the massive chisel tip is better. For large hookahs, this does not play such a role. At the tops of glass metal hookahs, there is usually a ball valve. It is worth checking out his work. In the assembled state (without water), return the hookah with your finger (remove the cup) and pour it into the mouthpiece. The valve must open and release air. Try to draw the air. The valve should be closed and do not let air into the hookah. If there is no way to conduct such a detailed check, make it easier. Carefully unscrew the upper part of the valve, keeping the upper part of the hookah at an angle, the valves up. Check the ball and the quality of the conical surface on which the ball lies. Burrs, furrows from the drill are undesirable - it is necessary to smooth the house with sandpaper. Pay attention to the material from which the tube is made, immersed in water - it must be copper, otherwise it will rust. Also pay attention to the hole in which the hookah hose is inserted. It should be round, flat, without burrs.